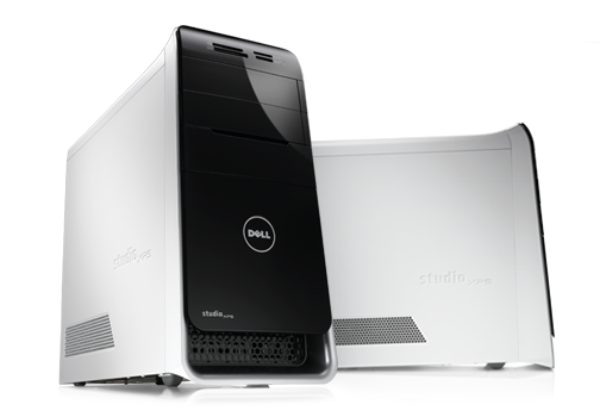 Transform your screen into the ultimate entertainment empire with the new Dell Studio XPS™ 8100. This sleek and sophisticated desktop boasts new Intel® Core™ i3, i5 and i7 processors, 3D capabilities and stunning graphics options, new THX® TruStudio PC™ sound for enhanced music and movies with plenty of room for expandability Its confident design will leave you speechless, while its powerful features will keep you coming back for more. Equip yourself with a pair of stylishly modern Active Shutter glasses, a lightweight alternative to the traditional 3D glasses with adjustable nose pieces to fit over prescription lenses. Plus they’re fully untethered, giving you a free range of motion up to 15 feet via the wireless IR signal. NVIDIA® software automatically transforms hundreds of PC games into a full stereoscopic 3D experience. Experience rich, immersive gaming with stunning realism supported by the latest graphics technology including NVIDIA PhysX, Microsoft® Windows Vista® and DirectX® 10. The new Intel i3, i5 and i7 processors are designed for faster multitasking, digital media creation and gaming. Go further without leaving your chair. Intel Hyper-Threading Technology maximises performance with an 8-threaded capability on 4 cores, so you can multitask with greater efficiency than ever before. (Hyper-Thread technology is only available with the Intel i7 processor). The dual-channel DDR3 memory offers a higher bandwidth than DDR2 that enables the Dell Studio XPS 8100 to work at a faster performance rate with increased responsiveness. It comes equipped with 4 DIMM slots for expandability — so as your needs increase, there’s always room for more. Our centrally located, easy-to-use application provides personalised support resources. Conveniently located on your PC’s desktop with quick links to service, support and system resources. Helps keep your system up-to-date and running efficiently through automated fixes for common configuration issues.